Starting this year, Batavia High School decided to remove the old lunch tables and chairs, and replace them with bigger tables with attached chairs. From both of the perspectives of students and Dave Andrews, we want to keep the new lunch tables. Looking from Andrews side, the new lunch tables are better. We definitely agree with Andrews because he gave us reasonsing why they changed them. It would be difficult to change back to the old tables because the school already spent money on the new ones and there’s no going back unless some serious problems occur to the new ones. Of course, there were many reasons why he had to switch them but the main reason why was that they were cost-effective. Replacing the tables was also time-saving and saved a number of man-hours. Not only did it save time, but it also created efficiency for other events. It would have to be an adjustment for the students but he knew they would eventually figure it out. “We knew going into it, it was going to be an adjustment time,” he said. We took some time out to speak to a couple of students to see how they feel about the change. BHS senior Payton Anselme noted some positives to the recent change. Going off of what Anselme said and how it brings students closer together, there are some good sides. 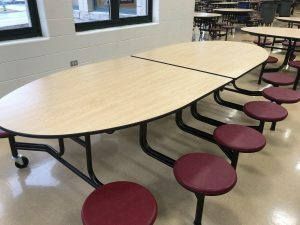 The school is saving money with these new tables, it’s easier to clean them and store them when there is a banquet or an assembly in the cafeteria. Going off of when kids are eating, it may be a bit more crowded but fewer people are excluded because these new tables are bigger than the old ones, and people don’t have to cram into a small circle to be able to eat on a table. In conclusion, there are many ways to look at the new lunchroom tables, but in the end, the students have to adapt to it and look at the bright side because the money that is being saved might be going to other things to help the students in the long run.